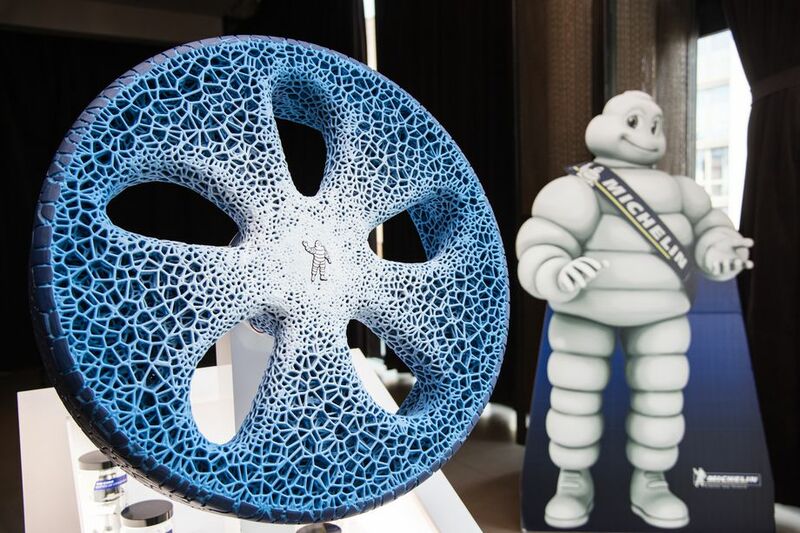 Share the post "Michelins revolutionary tire"
Michelin, the French tire manufacturer has recently presented what they think will replace currnent rubber tires used by everyone. On their Movin’ On conference in Montreal they showed what they say is not only a concept but something they can achive in a couple of years. This new strange looking tire is inspired by coral. As you can see it does not require any air at all and it is supposed to be made out of materials that are bio-sourced or biodegradable, such as: bamboo, wood tin cans or used materials. They want you to have only one set of tires that will last forever, but of course that seems a bit impossible because as we all know tires tend to run out of tread. That’s where this concept breaks conventional ways even more. Michelin will fit those with RFID sensors that will monitor usage of your tires, modern cars also come with this technology, but in this case you will reprint your tire. In dedicated stations or even at home you can rebuid your tread or even change it to suit current road conditions. By using machinery provided by Michelin you can choose whatever tread you can find. For example you want to go off-roading and you leave your home with tires that only match driving on tarmac, you can stop on your way to your destination reprint the tire and continue as if nothing happened. This fits into a trend in automotive world that includes reinventing everything that we have in our cars. Because technology is developing extremely fast it can be slowly applied into different areas of our life. Michelin presented us with this concept with autonomous cars in mind. Where the whole reprinting would be planned by your computer while you do not have to even touch the steering wheel. Even though this is quite a brilliant idea, it saves a lot of resources, is more eco-friendly than regular tires and probably will save you money in the long run it has some difficulties to face. For instance one of the aspects that one of the executives has mentioned was preventing the tire from degradation while it is in use. It will also need a big network of reprinting stations and it may take some time to develop those. This solution will drastically change the way tire manufacturers operate, they can sell only one set of tires to one customer and then base their profits on materials or services provided to keep those tires on the road. Overall this concept is one of few I think we will see in the near future. Michelin predicts that they may be able to send this into production in 2023. 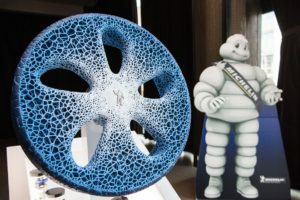 Do you think that this kind of solution will be profitable for Michelin? In my opinion, such concepts are made only to show what the future could look like, but has nothing to do with making this concepts into production. Tyre industry is a huge market, just think about how many people could loose their jobs because of such a solution . On the other hand, it would be truly great for the planet if we could stop producing classic tyres, which are known to have really bad impact on our planet’s environment. So, what is your opinion? Do you think that we should care about people and their jobs or the planet Earth? Or maybe there is a solution for satisfying both? I partialy agree with you that those concepts are just to show what the future may look like. On The other hand we are facing some serious Eco problems and this technology can solve it. When it comes to profitability I think it is easy, they will just make Money off those tyre rebuilding stations. It will cost some people their job but in the long run I think the enviroment is more important.